According to the NPD, Guitar Hero III is the biggest grossing game in recent history. Call of Duty: Black Ops may have been declared the biggest selling game ever, but that doesn't mean it's the biggest grossing. For the current generation, the NPD has revealed that Guitar Hero III takes the revenue crown. 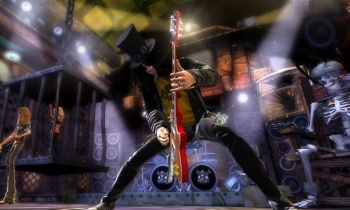 Guitar Hero III has reportedly generated $830.9 million in sales, while Black Ops brought in $787.4 million. Black Ops isn't that far behind, and will likely overtake Guitar Hero III in 2011 considering it launched less than a year ago in November 2010, while Guitar Hero III launched in October 2007. The top five are rounded out by Wii Fit with $736.6 million, Call of Duty: Modern Warfare 2 with $713.6 million, and Rock Band with $670.7 million. All of these figures combine the revenue from bundles (i.e. Guitar Hero with the guitar peripheral) with standalone disc sales. Guitar Hero III was the introduction of the once super-popular series to the Xbox 360 and the PlayStation 3, and it obviously rode that wave for as long as it could before crashing. Activision announced in February 2011 that it had no plans to continue the series due to waning consumer interest, though CEO Bobby Kotick believes it could make a comeback. If it doesn't, the Guitar Hero series will have to be happy with never having a single game hit that $1 billion revenue mark on its own, and that'd be a tragedy.